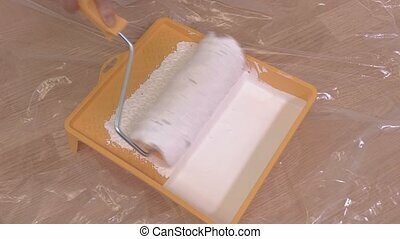 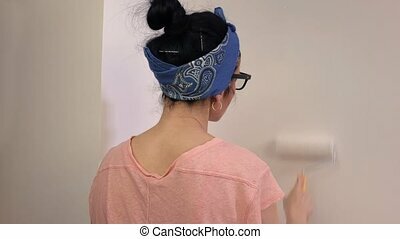 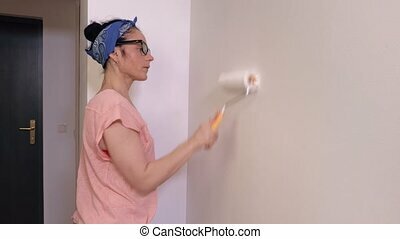 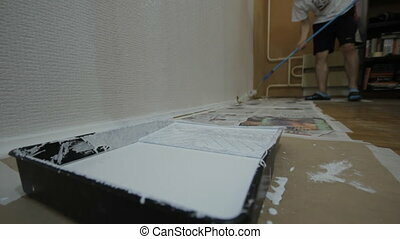 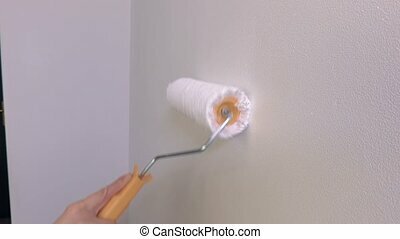 Roller brush paint wall. 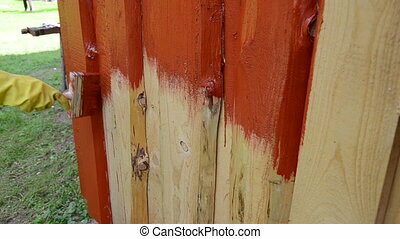 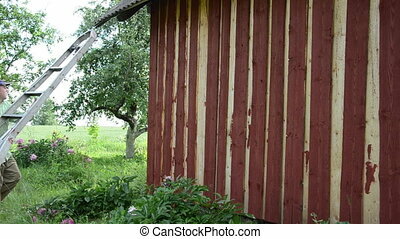 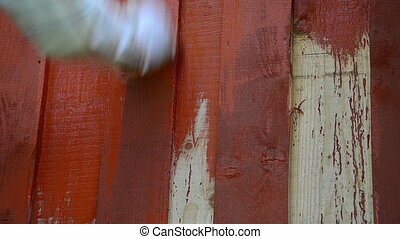 Closeup of roller brush paint wooden plank outdoor house wall. 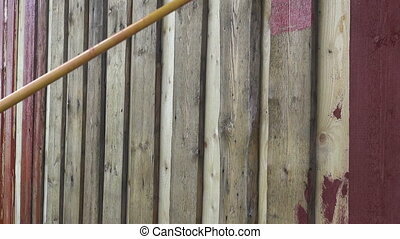 Closeup of roller brush paint wooden plank outdoor house wall. 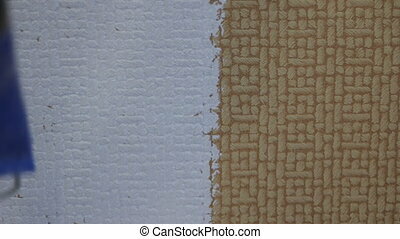 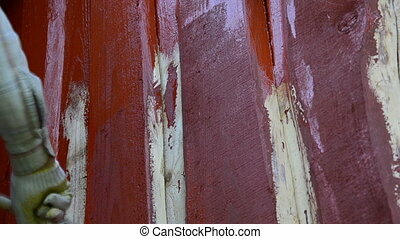 Closeup of roller brush paint wooden plank house wall. 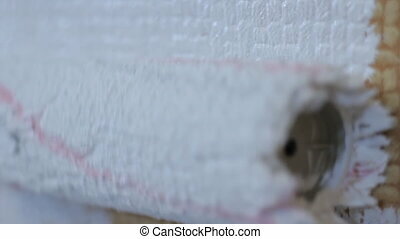 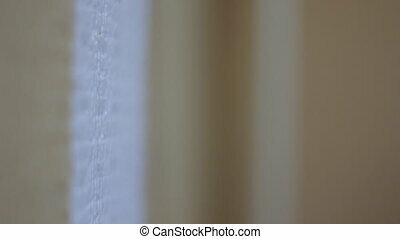 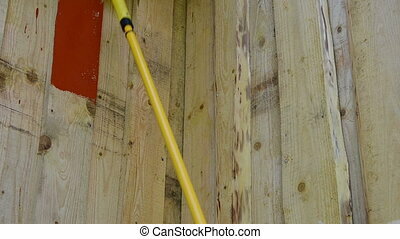 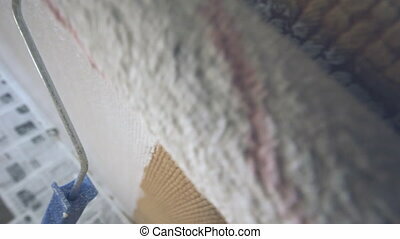 Closeup of hand with roller brush paintbrush with long handle paint wooden plank outdoor homestead house wall. 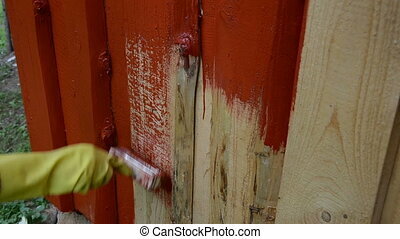 hand in yellow protective glove paint outdoor wooden plank wall with paintbrush brush in dark red color. 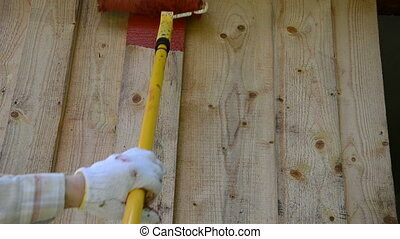 Closeup of hand in yellow protective glove paint outdoor wooden plank wall with paintbrush brush in dark red color. 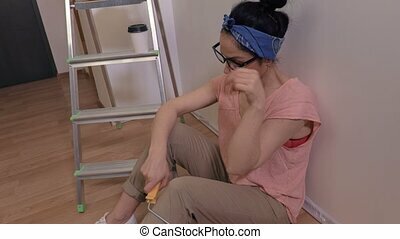 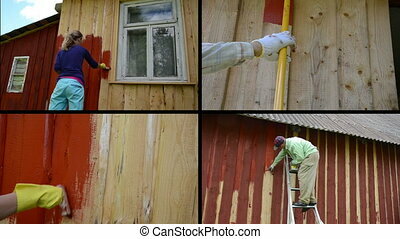 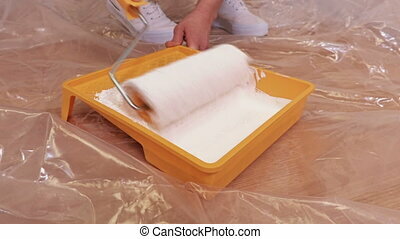 hand in yellow protective glove painting wooden plank house wall with paintbrush brush in dark red color. 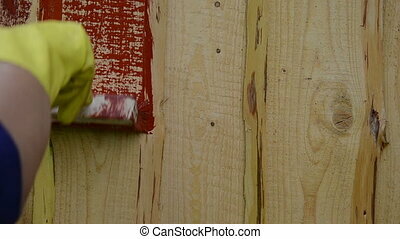 hand in yellow protective glove painting outdoor wooden plank wall with paintbrush brush in dark red color. 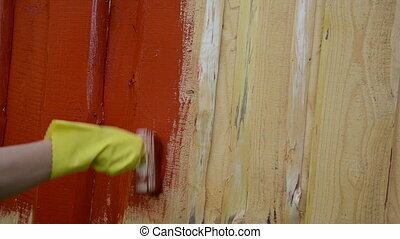 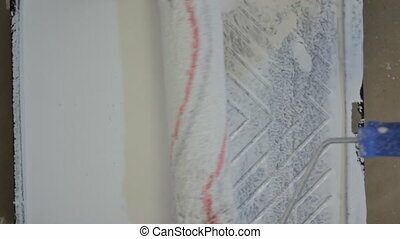 closeup of hand in yellow protective glove painting wooden plank house wall with paintbrush brush in red color. 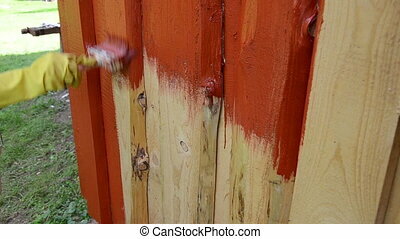 hand paint wooden outdoor plank wall with paintbrush brush in dark red color. hand paint outdoor wooden plank wall with paintbrush brush in dark red color. 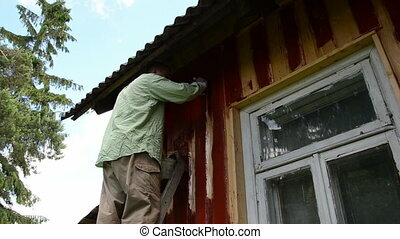 Painter man on ladder paint wooden rural house wall with brush paintbrush near window. 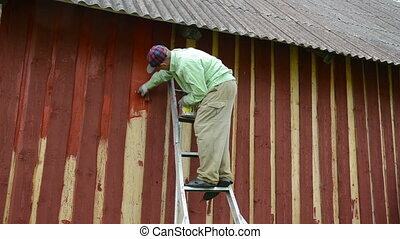 Painter man on ladder paint wooden rural garden house wall with brush paintbrush. 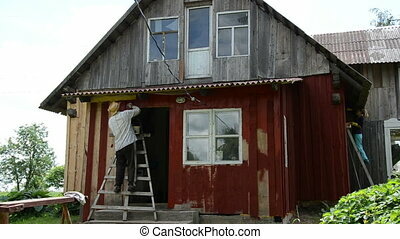 Painter man and woman on ladder paint old wooden rural homestead house wall with brush paintbrush.